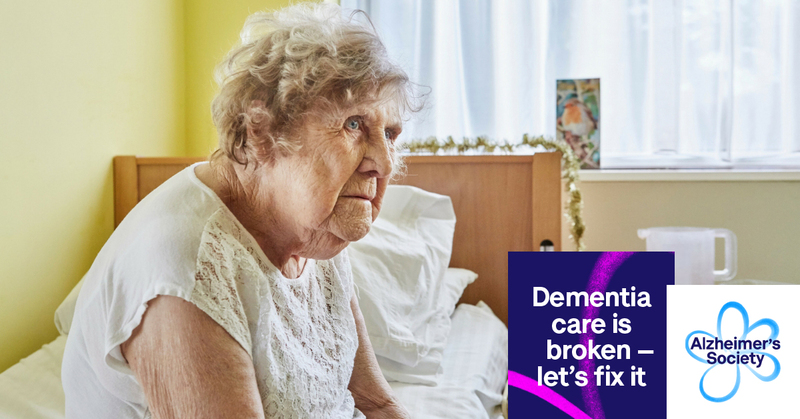 Successive Governments have promised to fix our broken social care system, but up and down the country people with dementia are stranded in hospital with nowhere to go. Many more are losing their life savings to pay for basic care. The Government has promised to lay out their plans to reform the social care system. As the largest users of social care, we must make sure the needs of people with dementia are included. Without us, they will be forgotten. It's time to end this national disgrace. If you've been affected by the issues our campaign highlights and you'd like to talk to someone, you can call our helpline on 0300 222 11 22. Yes, I'd like to stay updated on campaigning news, fundraising, research breakthroughs, volunteering and services. To get the government to listen we need as many signatures as possible - will you share this with friends and family? Will you join the campaign and stand up for people with dementia? Do you have experience of dementia and social care? Your story could be a powerful way to show the government and others how hard it can be for people with dementia to get the care they need. Can you spare 10 minutes to tell us about it? That's great, - thank you. Now, will you share your story? If you have experience of dementia and social care, your story could be a powerful way to show the government and others how hard it can be for people with dementia to get the care they need. OK, that's no problem, . Thanks so much for calling for better care for people with dementia. , thank you so much for telling us about your experiences of dementia care. Together, we can raise awareness of the challenges people with dementia face, and push for better support.